After seeing tons of cool cement projects on Pinterest, I decided it was time to hit up Lowes, buy a bag of cement and get going on my own!!! I started with these adorable little candle holders. I had been saving/hoarding the plastic containers from my favorite Sunburst tomatoes. It has the cutest star shape, perfect for little candle holders to use out on the patio. Although I would totally use these inside too. This is the cement that I used. There were a ton of different kinds, who knew, and all of the packages sounded similar, so I just went for one that supposedly had a more "fine" appearance. 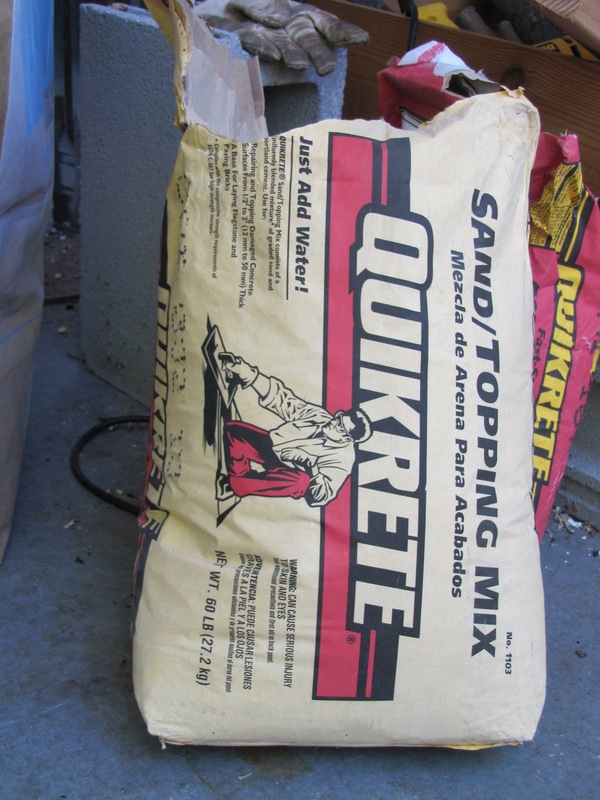 I have no idea what the sand/topping mix means. But it worked for me! I dumped some in a big bucket, added water and mixed it up with a stick. I just kept adding water until it was kind of thick, but I could still scoop it out with a cup and pour it into my mold. Like thick batter I guess, but I don't really deal with a lot of batter. I sprayed my mold with cooking spray and sprayed the outside of that little cup that is on the inside too. Then I just filled the tomato container with the cement mixture. I put the little apple sauce cup inside (to make the spot for the candle) and when it kept floating to the top, I put some rocks in it to hold it down. Make sure that you have it kind of straight. The hard part is not bothering it for about 24 hours. When it "looked" dry, I took the inside cup out, and the whole thing cracked. Don't do that! Then a couple of hours later I took another one out of the mold, and it cracked. Don't do that either! Just wait 24 hours so that you can pop them all out without any problems. I ended up with six of them, after the cracking. I filled some of the molds higher than others so I would have a little variation in size. 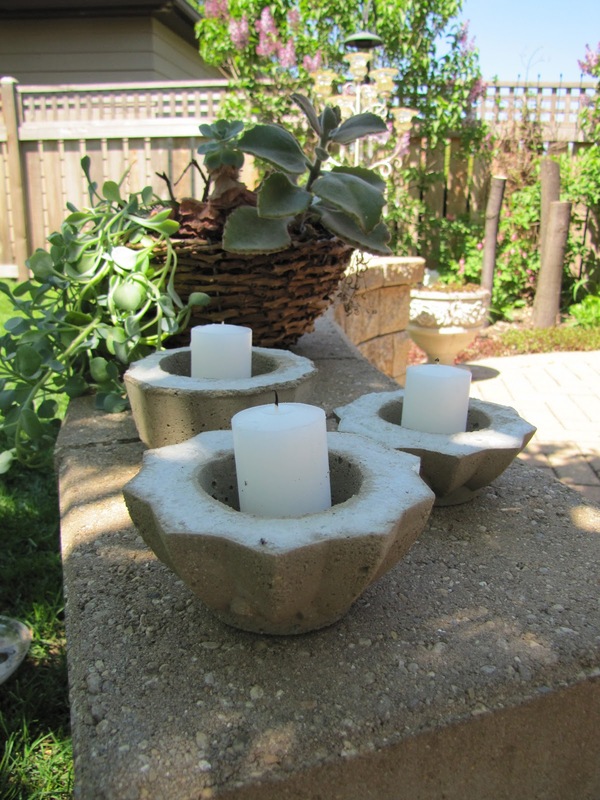 I just love my first cement project. I think they are as cute as can be, and they could not have been any easier to make. Now I have a lot of other cement projects in mind. Good thing since I probably have 49.5 pounds left in my 50 pound bag!!! Those are so darn cute. and what a clever idea to use the plastic containers from the tomatoes. You never cease to amaze me! Start saving your containers! I have 49 pounds of cement and I need to use it!!! I feel a cement play date coming on!!! !